This story originally published in the November 2014 (43.3) issue of POWDER. The new Kachina Peak chairlift at Taos is now open. Last March, I ran into a small fiesta on top of the 12,481-foot Kachina Peak at New Mexico's Taos Ski Valley. People were standing around under bright blue skies drinking PBR, taking selfies, and enjoying the surrounding view of the Sangre de Cristo Mountains. What looked like your typical end-of-season bash was actually a goodbye gathering. A group of locals had made the hike to this iconic spot for the last time before a new lift up the peak opens this season. They were celebrating, but also mourning Kachina, knowing it would never be the same. "Hiking Kachina has provided a meditation and method of earning your turns in a safe style," says Jessie Reines, a season-pass holder who grew up skiing Taos. "With the new lift up Kachina, the culture as we know it will change and it's sad to let that go." I didn't know about the impromptu party when I set out from my house in Albuquerque that morning, but I'd come to ski the peak for the same reason. Kachina is where I fell in love with hiking in my ski boots. The 40-minute, 1,600-foot climb is where I realized that snow is always better if you put in some work and that the turns feel better after you earn them, as cliché as it sounds. It's where I learned things like how to count my steps as a way to distract myself from the pain in my legs and shortness of breath in my lungs. It's also the spot where I first really scared myself on skis. Like everyone else up there, I'd climbed the bootpack because I wanted to experience the peak one last time before it entered a new chapter. 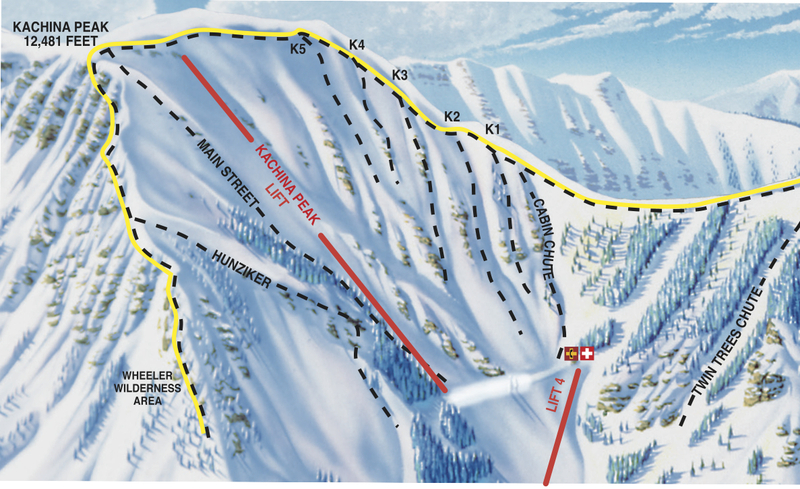 The new Kachina Peak Lift will be a triple and take about five minutes to cover 1,100 vertical feet. The ski area's lift-served vertical drop will go from its current 2,612 feet to 3,250, and will deposit skiers at 12,450 feet, just shy of the summit. Nationally, the lift is not out of character. Resorts across the country are growing in an effort to attract or retain skiers as thousands of Baby Boomers start hanging up their skis permanently. In 2008, Telluride added the Revelation chair, which provided access to the inbounds Gold Hill Chutes and out-of-bounds Bear Creek drainage. That same year, Bridger Bowl built the Schlasman's Lift up to the south end of their boundary, giving skiers access to what had been accessible by hiking only. Last winter, Breckenridge opened a high-speed sixer on Peak 6, adding 550 acres at 12,300 feet. And Red Mountain, British Columbia, will open a new poma lift this winter that adds 900 acres of lift-served skiing. The whopper is One Wasatch, which proposes to link all seven central Wasatch resorts with chairlifts. In some cases, these new lifts haven't caused much of a stir. At Bridger Bowl, the lift was news, but not highly controversial because the resort maintained other hike-to areas on its famous Ridge. For the 2015-16 season, Jackson Hole Mountain Resort plans to install a new high-speed quad that will dramatically shift how people approach its steep terrain. The Teton Lift will give skiers much easier access to several intermediate and expert runs in the Crags area, which at the moment is hike-to only. The chair will also drop people right on top of several Granite Canyon backcountry chutes, a proving ground. The resort plans to rope this area off and force skiers to hike to an already existing gate up the ridge. But what used to be a half-hour hike will now be less than 10 minutes away, or a quick poach. Doug Workman, a Jackson Hole guide, says he understands growth is important to stay viable, but he's not happy about losing the Crags as a hike-to area. He's even more concerned about the possibility of increased traffic in Granite, which sits outside the resort boundary, is not controlled, and can be deadly. If skiers who are unprepared start ducking the rope—something Anna Cole, the resort's communications manager, acknowledges people will be temped to do—it will likely spell trouble. This presents an interesting dilemma: If so many skiers like to hike for fresh turns, do they really need, much less want, all these new chairlifts? "Unfortunately there's no gray zone back there," says Workman. "You are either in serious avalanche terrain or you're not." Workman says he worries that more people in Granite will also ruin the character of the area. It's fairly accessible now via bootpacks, but those hikes keep a lot of people away, and the skiing still feels like a backcountry experience. I know Taos could use a bump. Over the past five years, the resort has fallen distressingly short of reaching its annual snowfall average of 305 inches. Forecasters say we could be entering an El Niño season, which means more precipitation for the Southwest. If the snow does fall, there will be many stories of powder days off the top of the Kachina lift. I also know I'll use the new chair this winter, and I suspect I'll like it. It's hard to argue with a five-minute ride to the top of a beautiful peak. Plus, other inbounds hiking opportunities exist along the Highline Ridge, West Basin, or in the 35 acres of new hike-to terrain in the Wild West Glades. At the same time, I worry about more skier traffic. When I hiked up last March, I was able to find a couple patches of fresh snow, and it had been 10 days since the last storm. Once the lift is in, the mountain will be shredded. I also wonder if the lift is going to create the kind of draw Taos hopes for. According to recent numbers from SnowSports Industries America, there has been little to no increase in skier visits nationwide for the past decade. Meanwhile, the number of people earning their turns in the backcountry has steadily climbed. Sales of alpine/AT boots are up 27 percent and sales of backcountry accessories like beacons, probes, and shovels have increased 12 percent. This presents an interesting dilemma: If so many skiers like to hike for fresh turns, do they really need, much less want, all these new chairlifts? If I had my way, I'd keep Kachina lift-free. I believe it ultimately hurts Taos more than it helps. It might give some people a new experience, but it's going to rob others, like my daughter, of a different, and in my opinion, more fulfilling one. She's only 14 months old—a long way from hiking a bootpack—but I would have liked to have taken her up that climb so she could experience the Zen of trudging along with her skis on her back. We'll have that experience together, I hope. But it's going to be somewhere else.